Kitchen and bathroom surfacing manufacturer Bushboard has unveiled the Evolve brand of slim, solid laminate worktops as an alternative to sintered stone. 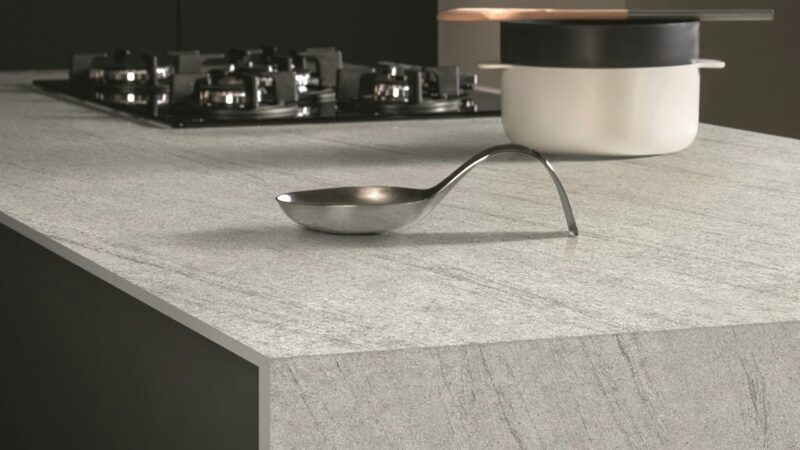 Made from 100% laminate, the worktops measure 12.5mm thick and come in a choice of 15 dual-faced designs, including stone and effects and four textures. The textures include ultramatt, granite, roche and touch, which is designed to be fingerprint proof. In addition, there is a choice of five core colours: white, cream, light grey, dark grey and extra black. which allowing routering of drain grooves and undermounted sinks, while complementing the decor. Alongside worktops, Evolve can also be used for shelves, curves, upstands and splashbacks. Commercial director of Bushboard Neil Horton explained the company leveraged the experience of parent company Wilsonart to create Evolve, following its experience with Zenith.